Launched laser-cooled atoms are captured by a single, suspended, single-wall carbon nanotube charged to hundreds of volts. A captured atom spirals towards the nanotube (white path) and reaches the environs of the tube surface, where its valence electron (yellow) tunnels into the tube. The resulting ion (purple) is ejected and detected, and the dynamics at the nanoscale are sensitively probed. 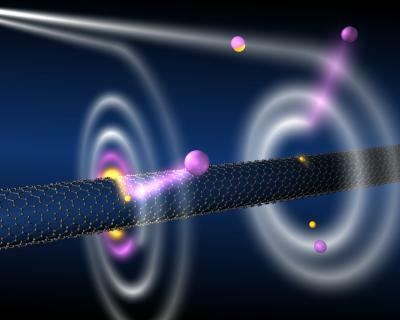 Carbon nanotubes, long touted for applications in materials and electronics, may also be the stuff of atomic-scale black holes. Physicists at Harvard University have found that a high-voltage nanotube can cause cold atoms to spiral inward under dramatic acceleration before disintegrating violently. Their experiments, the first to demonstrate something akin to a black hole at atomic scale, are described in the current issue of the journal Physical Review Letters. The vast majority of the atoms passed right by the wire, but those that came within a micron of it — roughly 10 atoms in every million-atom cloud — were inescapably attracted, reaching high speeds as they spiraled toward the nanotube. At this point, the speeding atoms separate into an electron and an ion rotating in parallel around the nanowire, completing each orbit in just a few trillionths of a second. The electron eventually gets sucked into the nanotube via quantum tunneling, causing its companion ion to shoot away — repelled by the strong charge of the 300-volt nanotube — at a speed of roughly 26 kilometers per second, or 59,000 miles per hour. The single-walled carbon nanotube used in these researchers’ successful experiment was dubbed “Lucy,” and its contributions are acknowledged in the Physical Review Letters paper. The nanotube was grown by chemical vapor deposition across a 10-micron gap in a silicon chip that provides the nanowire with both mechanical support and electrical contact. “From the atom’s point of view, the nanotube is infinitely long and thin, creating a singular effect on the atom,” Hau says. This work was supported by the Air Force Office of Scientific Research and the National Science Foundation.